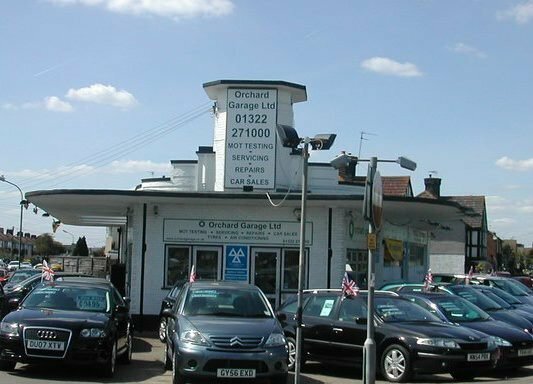 Orchard Garage Limited is a family run, independent garage based in Dartford. We MOT, service and repair all makes and ages of cars and vans, we also MOT motorbikes. We have a good range of used cars for sale on our forecourt, all are fully checked, serviced and come with a year’s MOT. We offer used car finance via Close Motor Finance and a number of other finance providers. We have courtesy cars available free to our customers and accept all major cards, including American Express. We take pride in the way we treat our customers and enjoy good relationships built on mutual trust. Many of our customers travel long distances to come back to us having moved away from the area! We are members of The Good Garage Scheme and many independent reviews of our Garage can be seen on their website too. As a company we actively support Dartford Cricket Club and also the Ellenor. I have been using Orchard Garage for a few years now for my MOT. Everyone is more than helpful and friendly, a lovely family run business and great hot chocolate!! I would highly recommend them. Thanks guys. I have used this garage for many years, and have always had an excellent and friendly service. I would always recommend them. Most impressed. Will certainly use them again. Honest and reliable, customer service with a smile! Great family run business, only recently found them via my daughter and wouldn't go any where else now. A genuine garage with fair prices, for both vehicle repairs and used vehicle sales is hard to find. Friendly, informative & helpful & efficient. Very friendly, were truthful in what needed doing and what not. For the fourth year running I have used Orchard garage for an MOT and service for my 9 year old Citroen Picasso and have always found the staff very professional and very honest. 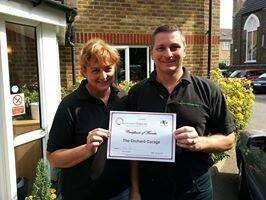 For anybody in the Dartford area looking for a trusted garage, I recommend giving Orchard Garage a try - you won't be disappointed. Orchard Garage are 'old school' in their approach. They are polite, friendly, extremely helpful and cannot do enough for you. They always book the car in when it suits you, which is almost unheard of in big dealerships, and you always get offered a cup of tea! They demonstrate how excellent customer service should be. Well done Orchard Garage!